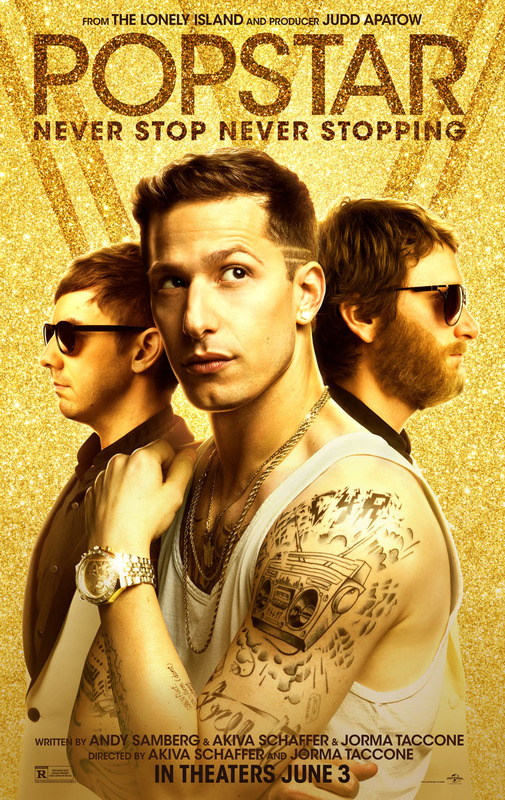 A movie that really captures the niche of Andy Samberg and what he does so great, this one is all about those clever music videos and the guy who makes them. Samberg plays Conner, a guy who is completely oblivious to how full of himself he is and how offensive his lyrics are. The songs are great. The situations he gets into are very funny. It’s only the storyline that is a little weak, following the usual, predictable formula. Considering how funny the movie is, that’s a worthwhile sacrifice. Andy Samberg, like many comedic actors who came from Saturday Night Live in the past two decades, really has one gimmick that he’s great at…the offensive idiot who makes outrageous music videos. Sometimes these SNL stars are able to keep the momentum going by taking their one-note act and finding all kinds of projects to make it work (Will Ferrell,) and other times their act gets tiresome and the American public rightfully runs out of patience (Adam Sandler.) In the case of Andy Samberg, the newest and freshest face to go from SNL into starring in his own movies, with his latest film, Pop Star: Never Stop Never Stopping, he hits the nail on the head. The movie is all about those music videos and the fictional life of a guy who would be making them. It perfectly captures what Samberg does so great. Now, the film is more than just a series of music videos. There is a plot wrapped around it. This is the story of the childish pop star, who made it big in his youth, as part of a group known as The Style Boyz. They had a few songs and catch phrases, each one more dumb and offensive than the next. And then the boys started fighting and broke up. All of this happens before the opening credits begin to roll. Conner(Andy Samberg,) now takes his act into solo stardom (kind of like Beyonce or Timberlake did when they left their groups,) and he takes one of the former trio members (Owen,) to be his DJ. The third group member, Lawrence, is the one who he had that fight with, and now Lawrence has retired from the business and is living out on a farm. We also see Samberg doing concerts, using a hologram video of himself to make it look like there are three guys on stage. And then he’s got a song called Humble, all about himself. Everything so far, going all the way back to the beginning of the movie, has been cut to brief interviews with real rap and pop stars (like Mariah Carrey,) about how much Conner has influenced their careers. The mocumentary element really works well for this film. And now, Conner is about to drop his second album. That’s where the real, current day, plot of the film begins. He counts down the hours. The tension and momentum are both there. Here’s a guy who has surrounded himself with yes men, (for example, they all pretend his basketball shot went in, when Conner fires it into the air and then turns away to not look, while actually shooting an air ball.) And now, after being built up this big by everyone he knows, his second solo album drops, and it’s a dud. The album is so bad, in fact, that it leads to all kinds of funny reviews including a negative score and a rating of simply the poop emoji. It is so bad that it leads to Comner making a deal with an appliance outlet store to put his music inside of all of their appliances. When somebody opens their refrigerator or washing machine or dish washer, one of Conners songs starts playing. It’s taking the term “selling out” to a new level, and when the system goes online across the country at the exact same moment, it causes a massive blackout all over the U.S. And now, Conner and his music are hated even more. At at this point, Conner and his manager , (played by SNL veteran Tim Meadows,) recruit an underground rap star to go on tour with him. The gimmicks continue to build from here. There’s the ridiculous helmet that Conner makes Owen wear, the way that the rap star won’t get off the stage to let Conner on, and the hilarious situation involving sn outfit change, tuck your junk back, that goes horribly wrong. The negative element to this movie is that it’s storyline is completely predictable, and falls right down the hole into a formulaic ending. But great comedies don’t need great stories. They just need to be insanely funny. And this movie is. It’s got the Christopher Guest- mocumentary element (Timberlake as the chef who cuts carrots in eight different ways and explains them,) the music videos, (so many great ones here, from the Osama Bin Laden one to the Mona Lisa you’re a piece of Sh:! Video,) and then all kinds of funny situations (the pancakes test, the marriage proposal gone horribly wrong.) If the plot was A little less formulaic, it would have been nice, but this is still a very funny movie with great rewatchability potential.